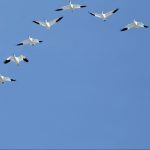 In the first part of this multi-part series, we looked at the existing Exchange 2007 infrastructure, how it will look during and after migration and walked through the high level steps we'll need to take to migrate to Exchange 2013. In the second part of this series, we'll guide you through the first part of the discovery you need to perform. This will help you better understand your Exchange 2007 organization before planning and implementing Exchange 2013. Depending on your organisation, you might need to look into more areas than we look in within this article - for example if you use a Mobile Device Management solution or have custom applications that are written to integrate with Exchange. However as a bare minimum, we'd expect to find out the information we'll collect here. We'll begin though by collecting some very basic environment information. When we realm about namespaces, we are looking to find out the names that are defined in Exchange for communication with Client Access Servers via protocols including HTTPS, IMAP and where used, access to Hub Transport Servers via the SMTP protocol. For larger organisations, it makes more sense to script the reporting of URLs, but for a small organisation it takes a couple of minutes to collect this information. After opening the properties dialog window for the virtual directory, record the External URL and Internal URL for each. Record the names listed on the certificates, and then verify the names listed are actually in DNS. If they aren't listed in either internal or external DNS then that means the names aren't actually in use and we can consider ignoring them. For example, to check internal Active Directory-integrated DNS, we'll access a Domain Controller and open DNS Management. Navigate to the domain and verify each Subject Alternative Name (and FQDN) listed. 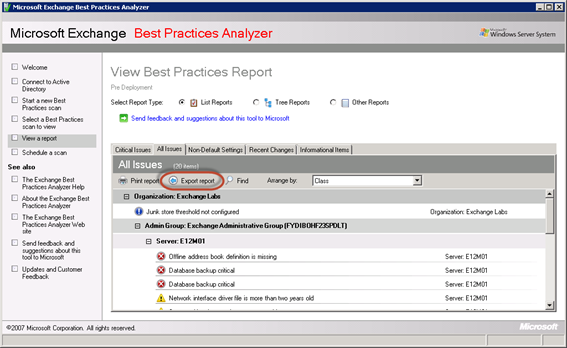 Finally we'll revisit the Exchange Management Console and view the name used - if any - for services including POP and IMAP. Navigate to Server Configuration, then select the respective IMAP and POP tabs and select the properties for each service. 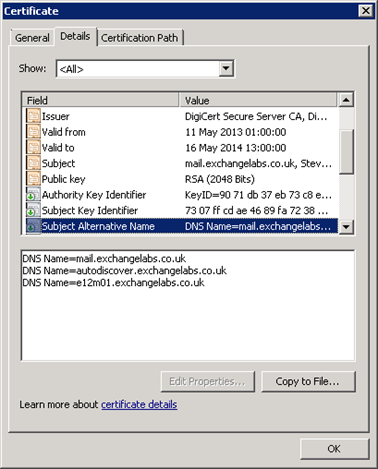 Record the x509 certificate subject name from the Authentication tab as shown below. To determine whether you need to consider either IMAP or POP namespaces, we'll check the service startup settings for both. 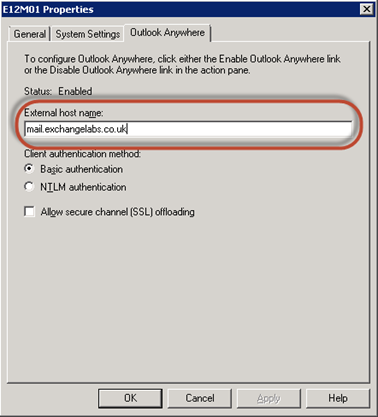 Open the Services Management Console via Start>Run then entering services.msc and scroll down to find the Microsoft Exchange POP3 and Microsoft Exchange IMAP services as shown below. By default these will be set as Disabled and Stopped. If they are set to start up automatically, then we'll need to record the names. 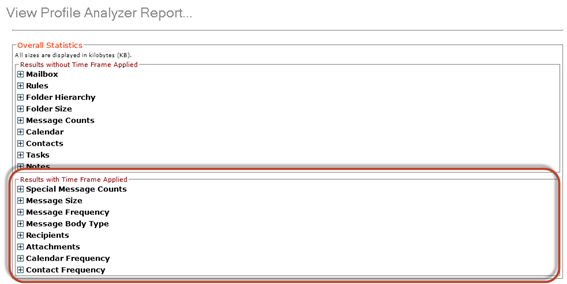 A great way of collecting information about the overall Exchange environment is by using my Exchange Environment Report script. 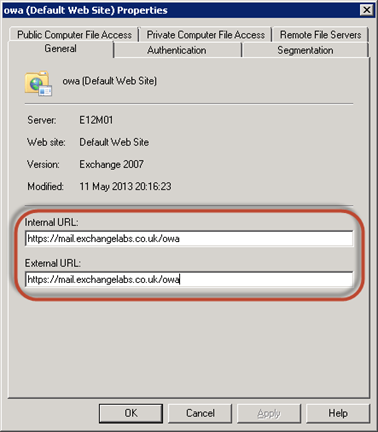 This script will provide information about the Exchange Servers within the organisation and includes site-level topology, installed roles, patch levels and information about Mailbox Databases such as used space. 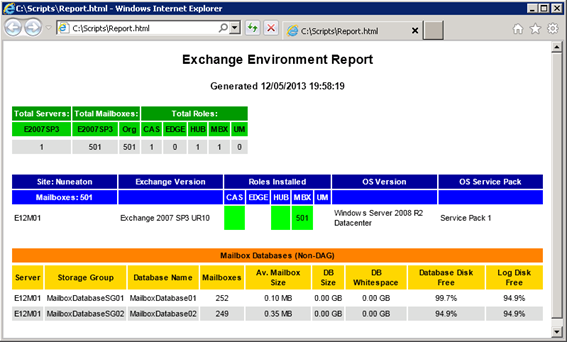 Download the Exchange Environment Report script from the TechNet Script Gallery and copy it to either the Exchange Server, or a host with the Exchange Management tools installed. As a pre-requisite for running the script you will need to ensure the host running the script has PowerShell 2.0 installed. Temporarily relax script execution permissions in PowerShell using the command Set-ExecutionPolicy Unrestricted. After you've used the script you may to change this back to it's original value. The EPA tool allows us to scan mailboxes within the existing environment to determine some very important values that will assist with sizing the environment. When we size Exchange 2013, we'll need to know the average message size and the average number of messages sent and received each day. We can collect this data using this tool. Get-ExchangeServer E12M01 | Add-ADPermission -user Administrator -AccessRights ExtendedRight -ExtendedRights "Send-As"
Get-ExchangeServer E12M01 | Add-ADPermission -user Administrator -AccessRights ExtendedRight -ExtendedRights "Receive-As"
Next, we'll download the Exchange Profile Analyser from the Microsoft website. We can install this tool on an administrative workstation or for our example, we'll install the tool on the local, single Exchange Server for simplicity. The current Exchange topology will be loaded by the EPA. 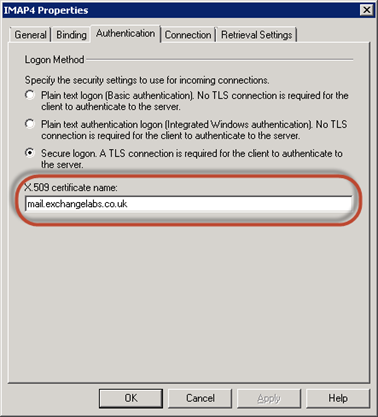 Before beginning the scan, we'll then set options including leaving Logging/Stats Options as-is with Information selected, and Output Statistics for Individual Mailbox left unselected, and select our Exchange 2007 Servers. We'll then ensure scanning over a period of time that is representative. For example, if it's currently during the summer holidays and we only scan a couple of weeks, our data may be incorrect because end users are on holiday and therefore sending less mail. Or if we are only scanning a period of time that represents then busiest period, for example the week that coincides with the year end, then our average figures may be skewed too high. A period of perhaps three to six months therefore may be a good starting figure to consider. After setup of the base options, we'll begin the scan by choosing Start Collect. Expect this to take quite a long time especially if you've got a larger number of mailboxes and needed to scan a longer period of time. First, expand Message Size. The value shown below Avg shows our Average Message Size. For the Send and Receive averages, expand Message Frequency and record the Avg figure shown against Aggregates of messages received per weekday including dumpster (real) and Aggregates of messages sent per weekday including dumpster (real). We'll use those figures to generate a table of average message size and average send/receive daily counts. 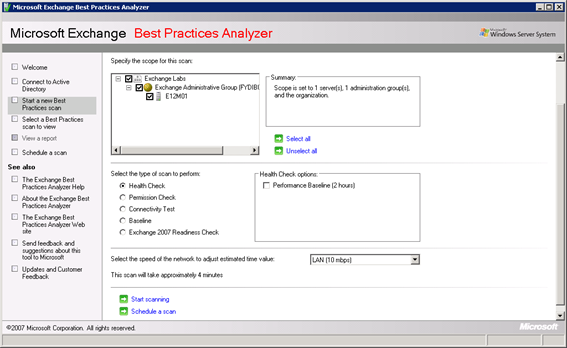 Sadly the Exchange Best Practices Analyser, and it's sibling the Exchange 2010 Pre-Deployment Analyser are no longer a part of Exchange 2013, but that isn't to say that they are not useful. 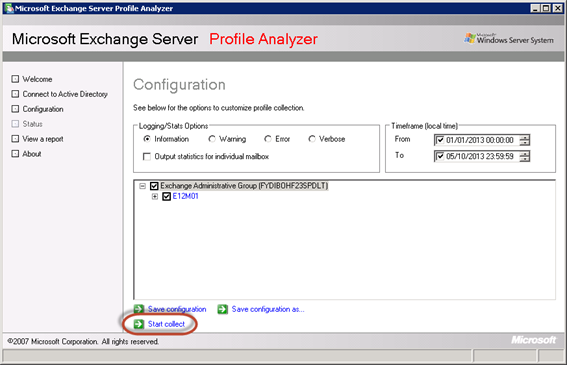 We'll use the output from the Exchange BPA to help identify whether there's any well known underlying issues we need to be aware of and correct before moving forward with the Exchange 2013 deployment. 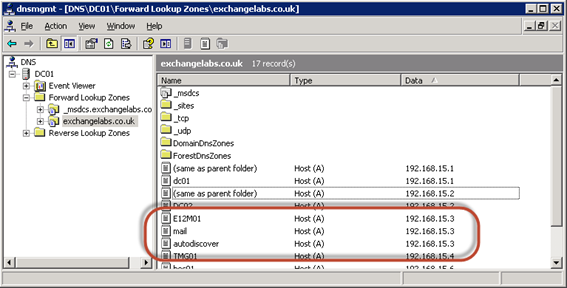 In the second part of this series we've started performing discovery against our Exchange 2007 environment. In the next part in this series, we'll continue to retrieve important data about the existing Exchange environment, focusing on Quotas and limits next before moving onto Client information. 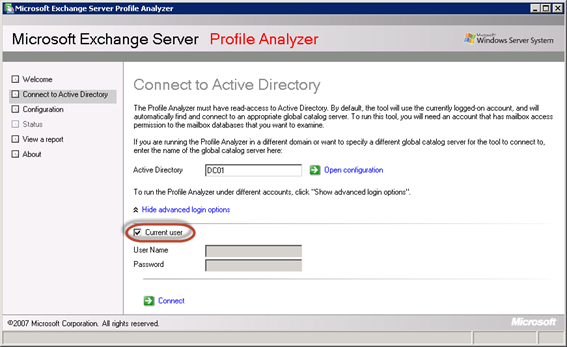 The Microsoft Exchange Profile Analyzer is no longer available.